Closet organizers may be just what you need to restore order to your chaotic closets in Milan, TN, and 31-W Insulation is the home improvement company you need to call. We are committed to helping customers like you design closets that meet their practical needs while paying close attention to aesthetics and individual design preferences. In our four decades of service, we have learned that it is important to work with only the best products available, which is why we offer closet organizers from ClosetMaid, one of the most trusted names in home organization. ClosetMaid’s shelving components are incredibly durable and will stand the test of time, remaining functional and looking good for years to come. They can also be customized to match the décor of your room, making your closet as aesthetically pleasing as it is practical. You have your choice of wood/ laminate or wire shelving and hanging components in a variety of finishes and colors. Additionally, you will be pleased to know that 31-W Insulation has been providing customers like you with outstanding service and value since 1972, so you can be sure that your job will be completed to your satisfaction. And, you can even count on us if your to-do list includes more than closet organizers because we also install fireplaces, foam insulation, garage doors, and much more. Contact us today and let us provide you with a complimentary consultation in your Milan, Tennessee, home. 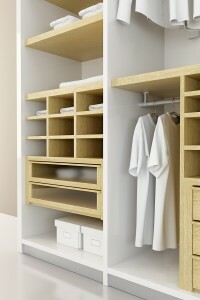 Find out how closet organizers from 31-W Insulation can enhance the form and functionality of your closets today.